If couscous is not available, this easy dish can be served over whole grains, such as millet, quinoa, or brown rice. Heat the 2 tbsp. water in a large skillet over medium-high heat. Add the garlic and onion and sauté 2 minutes. Sprinkle in the cumin, turmeric, paprika, and cayenne and cook 2 minutes more, stirring often. Stir in the zucchini, chick-peas, tomatoes, and raisins. Cover the pan and lower the heat to medium. Cook, stirring occasionally, until the zucchini is tender, about 15 minutes. Add salt to taste. While the vegetables are cooking, prepare the couscous. Bring the vegetable stock or water to a boil and stir in the salt and the couscous. Cover, remove from heat, and let sit 5 minutes, or for up to 20 minutes. Fluff with a fork before serving. Serve the couscous with the vegetable mixture mounded in the center. Adapted from Quick Vegetarian Pleasures: More than 175 Fast, Delicious, and Healthy Meatless Recipes by Jeanne Lemlin. 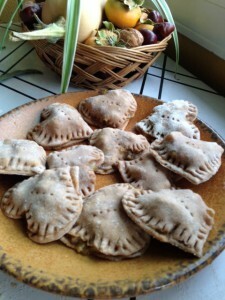 For more information about this recipe, check out the blog entry. This is tasty and easy. Adding a bit of cinnamon the second time I made it greatly enhanced the flavor. With the cinnamon, this recipe is going into permanent rotation. This was FANTASTIC! I have a family of 5, so I doubled the recipe. Should have tripled it! I was short on zucchini/squash, so I added a bag of frozen brussel sprouts. I was out of couscous, so we opted for quinoa. Substitutions worked well for us! GREAT way to use chickpeas! 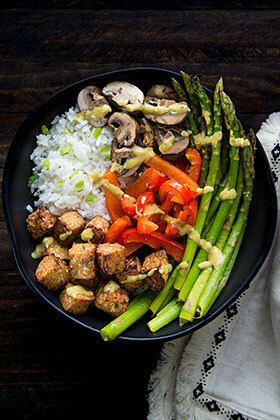 Dishes like this make week three of a plant-based diet a breeze! 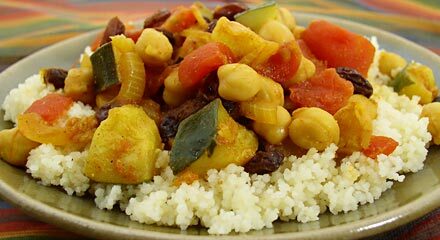 Love the soft sweet raisins against the spicy vegetables and chickpeas. I had one zucchini and one summer squash so that’s what I used and it was delicious. I will definitely be checking out more recipes from this site! Made this today and I must say that it almost didn’t even make it into my mouth, it smelled so strange! I left out the raisins, and added carrots and would definitely make it again. I’m not sure how Zucchini diluted the flavor. I was fairly generous with the spices, so perhaps that helped. Loved this, thanks so much for sharing! People might want to out the Zucchini, as it tends to dilute the flavour. Instead, like the the Tunisians, you could use turnips, cardoons and small cabbages. Also , if you have access to proper harissa beldi (not the tinned stuff) this will make an enormous improvement and once you start to get picky, you’ll probably see the benefit of the traditional preparation method (‘en 3 fois’) and of cooking fine, rather than medium grain couscous. However you look at it, this is a still a classic vegetarian dish. Was looking for a couscous recipe and searched your blog. Made this because we had all the ingredients available. So easy! We loved it! Even my husband who is a meat-eater and somewhat picky. Yum!